It is a joy to share good news from JCBT in Jerusalem in the first letter of 2018. What is the source of the joy? First of all simply because we are privileged, together with our friends, to be part of a grand project which is aiming to “fill the earth with the knowledge of God like the waters cover the sea”. This is happening drop by drop till a stream develops. This far JCBT has trained close to 150 translators in the knowledge of Hebrew and the land of the Bible, and thereby increased the realism of mother tongue translations in the world. The latest statistics show that there are full Bibles in only 674 languages, and that there are 1,515 NT without an accompanying translation of the Hebrew Bible/Old Testament. There is an urgent need for God’s message of light and love to be provided to new languages in a clear, natural and accurate way. One of our former students wrote: “If the good news is offered in the vocabulary of foreign languages which minority language speakers do not understand clearly, then for them the message is still VEILED and the gospel is given to such tribes in an unjust manner. To be FAIR everyone should receive the message in a language one understands well. Only then they could make conscious decision, develop personal relationship with the Lord and a devotional godly lifestyle based on understanding the word of God” (Daniel Gya). It is now a joy to introduce to you the 15 students of 2018, 10 men and 5 women. They come from 9 countries: Brazil, Ethiopia, Ghana (3), Malawi, Mongolia (3), Nigeria, Paraguay (2), Russia (2) and Singapore. All are working on minority languages, most of them on their own mother tongue translation of the Hebrew Bible. They were accepted into this unique Hebrew University accredited program, but only after passing a demanding test on knowledge of Biblical Hebrew grammar. 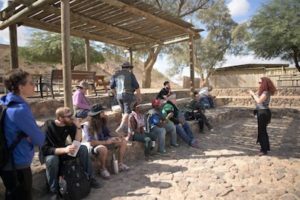 Now, just two months into the program, most are able to carry a simple conversation in Hebrew and read and understand the Hebrew texts which are read during the weekly all day study tours at the actual locations of the Biblical events. This is the core vision of the study program of JCBT: the Hebrew text read in its original context and experienced by a national translator; this is what gives the possibility to fathom the meaning of the text, which is then conveyed to the mother tongue. 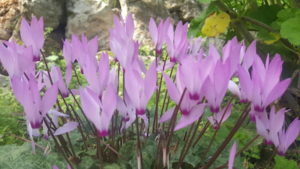 Spring in Israel is beautiful but all too brief. This Spring has been unusually early and warm. 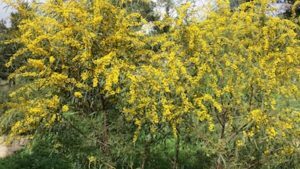 Students can see and smell biblical plants and sometimes even taste. Such experience opens the meaning of much of the imagery found in the text. Students are also taught about the animals of the Bible. Thankfully there is now a new Museum of Natural History where the animals of the Bible can be seen stuffed or live. Every Friday evening we have a Shabbat meal in the lovely Finnish Log house dormitory where the students are residing. After the meal we hear the story of a student’s translation project in which he/she is involved. We hear and thrill to the personal testimony of committing ones life to this all encompassing task to bring the word of God to their own people, who have never heard it at all or only through a veil, i.e., through a poorly understood foreign language. This far we have heard 4 fascinating reports by nationals working in Mongolia, Ghana, Paraguay and Brazil. The 3 translators from Mongolia are all working on the new Standard Mongolian Translation project, which aims to translate the scriptures straight from Hebrew to Mongolian. It is a first. The students were sent to us by our former student Dr. Bayar Garamtseren, the leader of the project. He took our 6 month program years ago, studied in USA and completed a Ph.D at Cambridge University in England. The 3 from Ghana each represents a different mother tongue. Their people cannot yet get the message, because they do not know English, the main language of the country. Each of the 3 translators came here to correct that situation by committing their lives to providing clear and accurate scripture in their mother tongue. One of them, named Rose, told me how it happened. While visiting her village, she heard an interpreter translate from English to her mother tongue. However, he made frequent mistakes, so later she talked to him and commented on them. “But I am trying my best”, the person said. To that Rose resorted “my people need better than that”. She is now one of the main translators for her people. 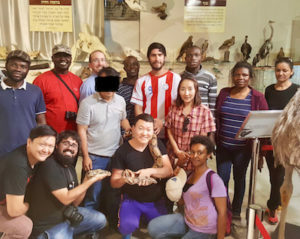 We have never had translators from South America before, so the story of their situation and the translation work in Paraguay and Brazil were a shock to us. We did not know that the indigenous people had been treated so cruelly for hundreds of years; even whole tribes were sometimes massacred by the Spanish invaders. In fact, they were not considered as human in some cases, and so they were treated as dangerous animals. A huge change came about when mission societies attempted to reach them by learning to speak their languages. It became clear that Bible translation is the key to bring the message. The 2 Paraguayans are committed to reaching a people group which had been largely decimated but is now again growing in numbers. The student from Brazil, with some indigenous background herself, has been a blessing by reaching out to them. She was sent to work in PNG, which similarly has many small languages, who need to be reached with God’s word. The commitment of these students was touching, both in their work among these people and in their commitment to undertake this demanding study program. It is because they want to grasp the message themselves more accurately and powerfully. The 2018 semester program is well underway with a hardworking group of students from 9 different countries around the world. It is always amazing to talk to the students individually and hear each of their unique stories. They come from so many different parts of the world with so many different backgrounds and with such a variety of experiences. What a blessing it is that God has brought these particular students to His Land to better understand His story. It is exciting to imagine the countless ways in which God may use them to bring about the work of His kingdom. News: Adam and Nikole are pleased to announce the birth of their third child on November 14, 2017. Yovel Kenneth Van Goor is a blessing from the Lord. He is a happy, healthy little boy who loves hanging out with the family and playing with his big sisters. JCBT’s 2018 short-term courses have had an enriching and exciting start! January began with JCBT’s Open Consultants Course which was designed for 20 Translation Consultants and Consultants-in-training to provide a more thorough understanding of the Hebrew contexts of the Bible. 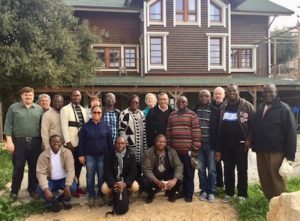 In February we welcomed a unique group of the United Bible Societies CEOs from French-speaking African countries. The countries represented for this course were: Togo, Chad, D.R. Congo, Cameroon, Guinea, Gabon, Central African Republic, Ivory Coast, Senegal, Benin, Madagascar, and Burkina Faso. Through the intensive 1-week course, the 14 CEOs were given a dynamic summary of what Bible Translators experience during their time with JCBT, while also gaining valuable knowledge and understanding for themselves. In February, by God’s grace, a new initiative called “Hebrew for the Nations” started – this is an intensive semester course (sponsored by the Jerusalem Biblical Studies Society in cooperation with JCBT and “Lech Lacha”) for Israelis learning Biblical Hebrew to send them out to the nations to teach Biblical Hebrew mainly to Bible Translators. We continue to prepare and pray for six additional short-term courses that will take place later in the year. In mid-July we will joyfully receive Bible Translators with The United Bible Societies from the Portuguese-speaking African country of Angola. Just after and also through The United Bible Societies, Bible Translators from the Americas (Spanish-speakers) will join us for a rich course on the land and context of the Bible. In August we will conduct an intensive Hebrew course for Seed Company OT Consultants becoming NT Consultants During October, we will have the privilege of welcoming a group of Deaf Bible Translators from Deaf Missions to experience a remarkable, unique course taught in sign language. During the last week of October, we will hold another course for The United Bible Societies CEOs from Spanish-speaking countries in the Americas. To finish off the year, JCBT is conducting a Special Psalms Course in November with Ernst Wendland and Lynell Zogbo, exploring both semantic and grammatical features and realia here in the Land of the Bible. JCBT provides a unique experience. We celebrate both Passover and Easter with our students…ON LOCATION. This year we are innovating and plan to celebrate the Passover meal at JCBT independent of the rabbinic date for Passover. This decision puts the events in chronological order for the students, because after the meal, Jesus went to pray (close to midnight?) at Gethsemane. Accordingly, after the meal, we plan to walk with the students from Gethsemane, as we have walked for years with the students – from Gethsemane, where Jesus was arrested, to the High Priest’s house for the “trial” and custody over night. We conclude the hike in the prison below the High Priest’s house from which Jesus was taken the next morning to the Sanhedrin, to Pilate, to Herod Antipas and back to Pilate. … then to the place of the skull and then to the tomb of Joseph of Arimathea. This will be excellent preparation for the students who have all been invited to celebrate with Jewish families on the rabbinic date. “Nobody takes my life from me. I lay it down and I take it back up again.” We gather at the Garden Tomb on Resurrection morning. We rejoice: HE IS RISEN! HE IS RISEN INDEED! Thank you for your support in spreading this message of resurrection power. Already when they come our students have a unique appreciation of the Scriptures. Some have already endangered their lives because of their love for the Lord and desire to share the message of the Scriptures. Jesus declared that repentance and forgiveness of sins are to be preached in His Name to all nations. Much of the world has already been radically changed by HIS values and HIS power to overcome death and save us. BUT most of the world has NOT taken the message of God’s love to heart and hundreds of millions have never heard a word. YOU are the carriers of this mission! Donations can be made through our website BIBLETRANSLATORS.ORG. Electronic USA check (or savings) account.This method is the most effective for JCBT and you. It has the least cost and can be scheduled flexibly. Electronic Check or Credit/Debit Card click here.